Trying to balance a laptop computer on a music stand has never been a safe move - yet you want it right where you can reach and view. Here's a better solution. 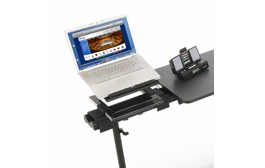 Now you can have your laptop right at your Flex Conductor's System with our Laptop Computer Mount. It attaches to the TechBridge of your system and can be adjusted to different heights and angles. The large 12" x 12" surface with non-slip pads will accommodate almost any laptop. And simply plug the cooling fan into the USB port on your laptop and you'll never have to worry about overheating. Z-lift with support shelf supports the weight of the heaviest notebooks. Elevates and angles for best viewing. Fold flat for convenient storage. Support shelf extends outward for thicker notebooks. Non-slip pads for dependable positioning without interference.